As women living in today’s society, it so hard to identify ourselves. I can personally say that I have been through this. Often times, life wants and tries to identify me by what I’m currently doing, how many children I have, my work status, and even my husband. While all of these are apart of who I am, they are not my identity. If this is true, why do we struggle with it and how can we overcome it? Studies have shown, that women are relational by nature. We want to connect, deeply, with others. Yet, we generally fear that we are too much for those around us and once those in relationship with us realize it, they will run away in fear, leaving us relation-less. Due to this relational nature and our desire, we tend to dive completely, heart first, in to our relationships and endeavors. By doing this, we find that we care deeply for the people that we care for. We find that we want to nurture and help them to be the best that is humanly possible. We take the opportunity, while in relationships with others, to cultivate our love and compassion for them throughout our relationship. We want them to know how important they are. In essence, when women love, we love hard. These loving relationships, if we are not careful, can begin to completely consume us. And this total immersion into the who and what, that we are into, begins to become how we identify ourselves. We become proud of our connections and work. Remember, when we love we love hard. Do you know anyone that, when they truly love a person or thing, hides it. No, you don’t because it doesn’t happen that way. Love proclaims, I love _____. So what is the problem with this? Well the problem is that things and people change. They were never meant to be the indenting factors in our lives. We were never intended to mimic or display the characteristics of a person or a thing. Not our husbands or our children. Not our jobs or our passions. No matter how great they are. When I was first married, I had completely lost my identity. I, like many other women, love my husband passionately and this caused me to immerse myself in who he is. However, this total consumption of him, continually, caused me to forget who I was. While as a wife, I was called to take on my husband’s name and cling to him, I was never called to become him. Together we become one, but this is through a process of continually becoming the unified couple that God has joined together in Him. Identifying myself by my husband, left me lost, hurting, and confused. It also brought problems into our relationship. I had to begin to learn who I was again and what it meant to be me. Thankfully I had help with this. Yet, my help was not one that many would think of. It came from God. Because of how lost, broken, and confused I was, I began to cry out to God for help and He led me to His Word. 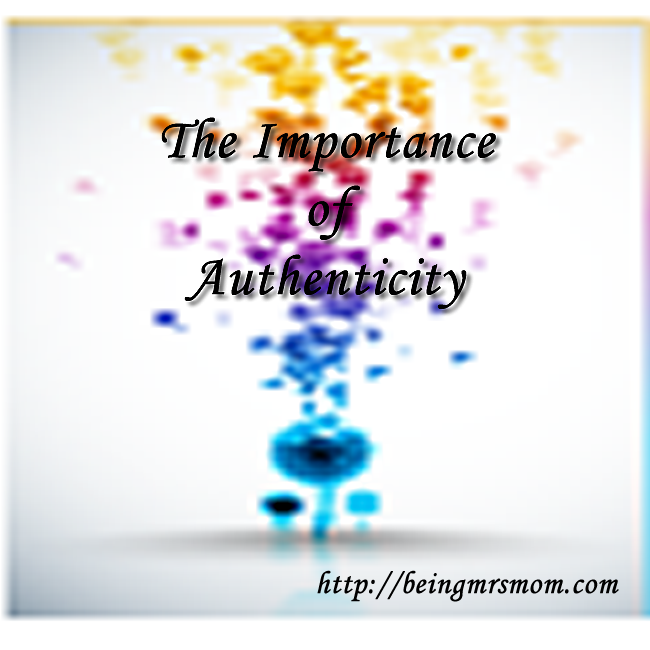 Through it, I began to see that I could be passionately in love with my husband and still be me. The me that God created me to be, not the me that I was trying to be for my husband. I began to learn that God had created me a certain way and this complimented my husband, children, relationships, career, and so much more. 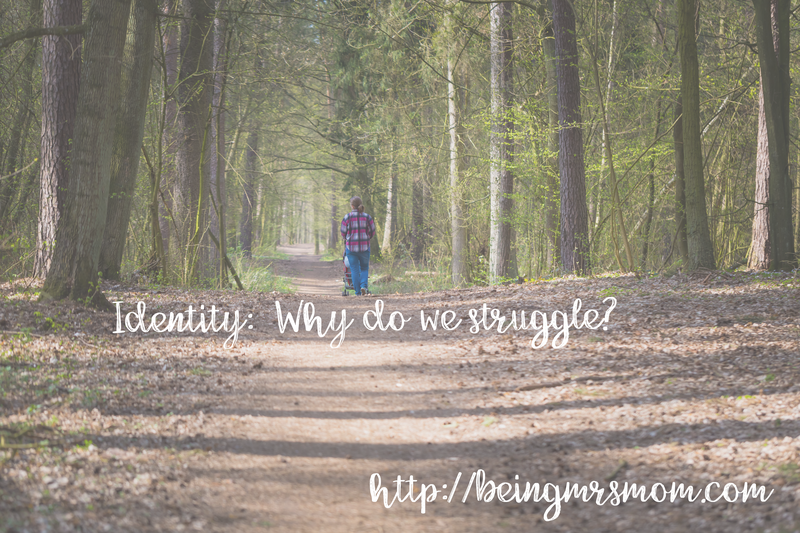 I began to understand that my identity in Him was more important than any other identity that I would ever attempt to take on. Today, my husband says that one of the reasons why our marriage works is because he is he and I am me. 🙂 However, the struggle to get here was…well hard. Now how did I get from point A to where I am now? It was not easy. I had to begin to let the Word of God consume me. Some people thought that I was changing, but if I am to be completely honest, I was. I was changing from the rejected, fearful, and confused little girl who the world and situations had created, into a confident, loved, and courageous woman who God has always known that I was. I did this one day at a time…one page at a time…one prayer at time. Yet, at that time, I was in such a hurry. I thought that if I did not hurry up, I would never become…me. The truth is that God loves me so much that He was going to make sure that I was completely identified by Him. His plan was never to leave me the way that I was, so I had to learn to trust Him. The process has been difficult and I continually find that life attempts to define me, but I trust in Him. The situation for you is that same. He loves you too. casting all your care upon Him, because He cares for you. 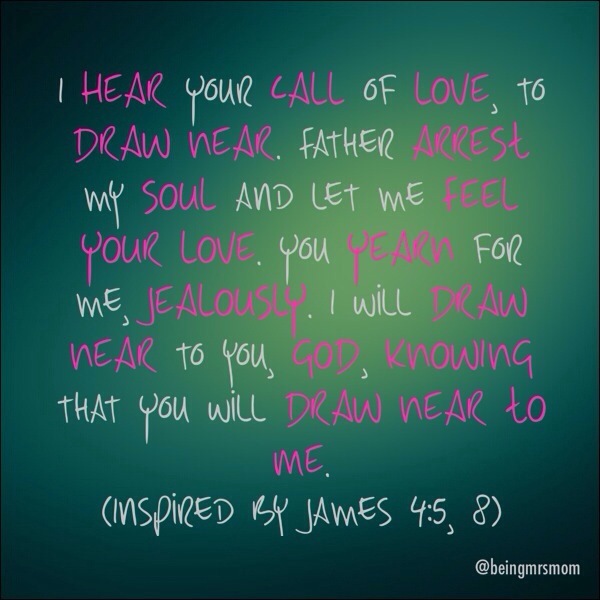 This has always reminded me that no matter how unloved I feel, I am loved. No matter how much I want to hold on to the situation and take care of it myself, there is a Great and Mighty God that wants to do it more and He does it a lot better than I ever could. Today I want to encourage you to take that first step in solving the issue of displaced identity. Read Psalm 139 and see what the Lord says about you. Think about how it makes you feel when you realize how much He loves you. Do you see how He sees you? How can it change how you see yourself? Take a moment, a piece of paper, and pen. Write out your thoughts. This is how your process with begin. With looking at God and becoming aware of your own feelings & emotions. I have to remind myself of this, sometimes, because the world tries to tell me otherwise. I’m sure that it says the same thing to you. It says that our value is based on what we can do and on what we have. Yet that is not true!!! 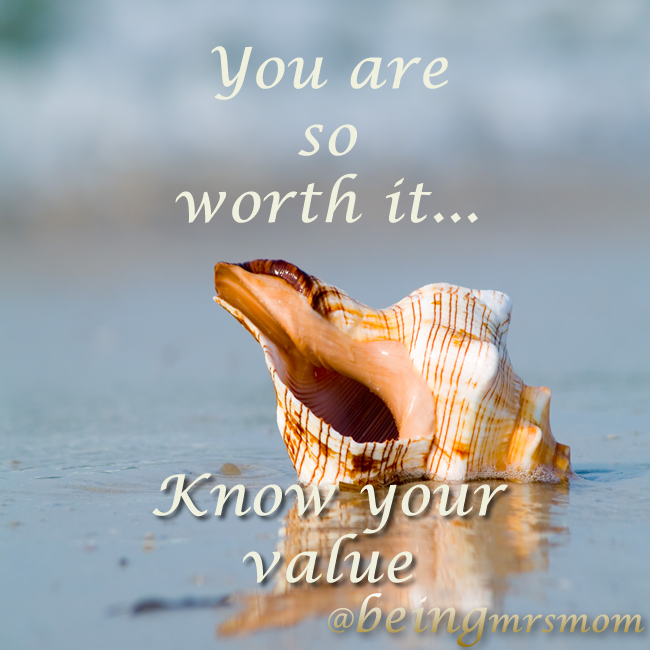 Your value is in who God says that you are. 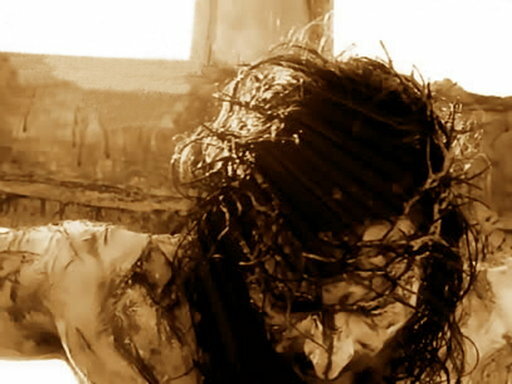 It is obvious by the price that He paid, that your value is in Christ Jesus. Let us not forget how valuable we are. 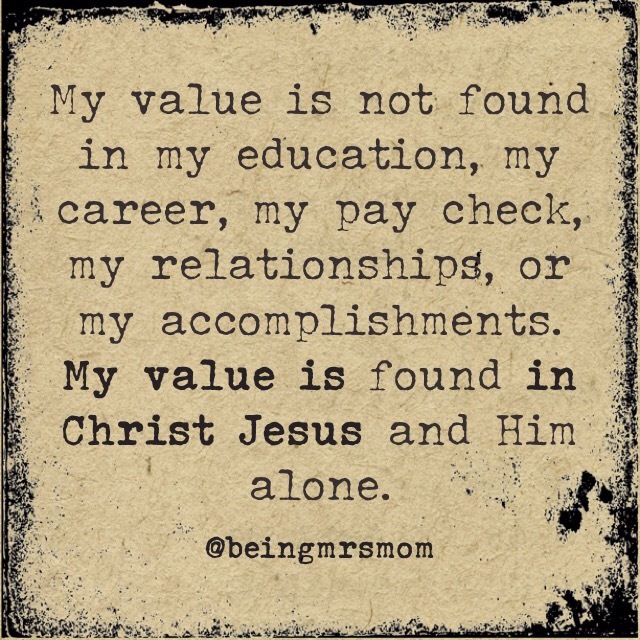 The Son of God is our value and our worth. Does that spark any thoughts in you mind? Well, It is 2am and I am sitting in my bed typing this. I wanted to make sure that I discussed it while it was fresh on my mind. We all have a message. Some of us feel that we are less heard than others, so we begin to reach out for a bigger platform that will afford us the opportunity to get out message out to a larger audience. Yet, many times, we never stop to think about when we will be satisfied with the size or magnitude of our platform. When will you be satisfied with the size of your audience? Have you realize that your message has the power to change someone’s life? If you focus on the size of your audience, you may never say what you need to say to change the life of that one person. Yes, one person matters. Will you be happy if your message changes 500,000, 100,000, or 5,000 lives? How about 500? What about 100? What if your message reached 50 people and their lives were changed? What if you message reached 5 people? Would you be happy that those 5 people were always attentively listening to your message? What if the message that you shared changed the lives of those 5 and then they, in turn, had an impact on their sphere of the world? Ironically, my family has 5 of the members, besides myself, in it. Years ago, I told the Lord that I wanted to change the world…He gave me my family. My role as a wife and mother has become the most important role in my life outside of being a child of God. I have come to realize that nothing else can be placed above these two God-given roles. Now although I am a wife and mother, I am also a writer. I have come to learn that I must know my audience. When I am talking to my family, they are my audience. My message is for them. However, when I am writing, my message is for a specific, God-given audience. I believe that we have to understand and appreciate the fact that God has given all of us an audience. Whatever it is that you do, you sphere of influence is God-given. You don’t have to change your message in order to attract your audience. Share the message that God gave you and watch those within your sphere of influence; receive a major impact in the way that God ordained. Stop focusing on the numbers. Stop thinking that no one is listening. Those are all distractions. We all have to realize that our message is bigger than ourselves. Whether the listener responds in a way that communicates what we are expecting or not, we have to understand the potential for our message to reach their hearts and to inspire them. I understand the statistic. “If you have a larger number of people in your audience, the greater amount of people who might hear your message.” Yet, you are focusing on the numbers, not the message. Let me give you a different statistic. If you have a larger number of people in your audience, the greater number of people who may possibly encounter your message, but they might not be listening. Yet, if you focus on the quality of your message and know your audience, regardless of the numbers, someone will most likely listen and be greatly impacted. What I am trying to tell you is that focusing on the numbers causes us not to be authentic because we are willing to do whatever is necessary to get our numbers up. We become blinded by the numbers and unable to see all of the people who God has placed in our lives, who are actually listening. Don’t change your message to make people listen. Share your real message and the people who are supposed to hear it, will listen. When I first married my husband, I was convinced that he was a great guy. I knew that he would always love me and show me that he cared. As we moved into our second, third, fourth, and even fifth year of being married, I could see his flaws more than I could see them originally. I considered how I thought he had changed and was determined to help him remember the qualities that he had possessed before, which qualified him for the “great guy” category. What I did not know was that he had always been a flawed individual, but because of the love, passion, and desire that I had for him, I could not see them. When we were dating, my husband would show up early for our dates. He would ring the door bell and then patiently wait for me, on the couch or in the car. When we arrived to our destination, we were always early. Later on in our marriage, he would get ready and promptly remind me of my need to speed up, as I got dressed. He wanted us to arrive early to our destination, but I was taking my time getting dressed. Over the years, I had tried to change various aspects of who he was, but learned that it was more difficult to change him, than it was to change something in myself. He had always been very punctual…nothing had changed about him. Had I been unaware of the changes that had occurred in my own personality over the years? The more I asked this question, the deeper I dug into the root of my issue. The more I dug, the more I prayed. The more I prayed, the more God began to show me…myself. He helped me to see that I wasn’t perfect, but He never considered me so flawed that I could not be loved. He showed me that He had actually given me time, as He would continue to in the future, to get past certain struggles and be the woman that he created me to be. He showed me that there were various aspects of myself that would need to be changed before He would consider me mature. Yet that never changed how He saw me. It never changed the fact that He considered me precious and lovable. Learning to see myself through God’s eyes, helped me to see my husband in the same way. I began to accept who he was and his “flaws” became characteristics that I cherished. Our differences came to be the strengths of our marriage, when previously, I had considered them weaknesses. Today, I am a more punctual person. Although I still struggle with consistency, my husband’s ability to remain consistent will definitely rub off on me, I’m sure. I consider that my perspective is often times what needs to be changes, not my husband. God will and does work on him, but my job is to allow Him to work on me. I love my husband more and more each day. I cherish the ways that he sharpens me like iron, even when it’s not comfortable at the moment. When I look back on it all, I am thankful. Can you relate to what I have said here? 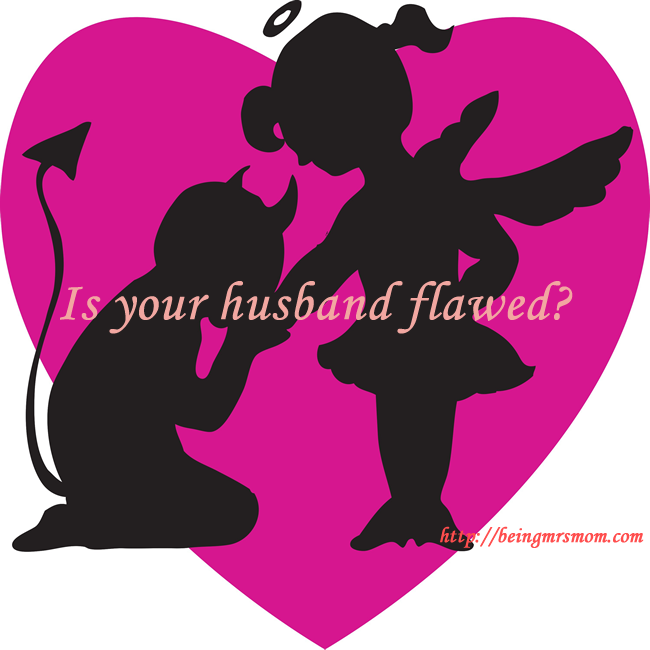 Do you find it easier to identify the “flaws” of your spouse that it is to identify your own flaws? How can you change your perspective and actions to make the weaknesses of your marriage the strength of your marriage? I’d love to hear from you. Leave me a comment below and consider joining my email list to receive weekly encouragement and exclusive monthly content. A few weeks ago, I was talking to a friend. As we sat and talked, we began to discuss our roles as women today. We looked at who we are as wives, mothers, friends, daughter, and so much more. As if those roles had not demonstrated to us the importance of the call that had placed on our lives, we began to discuss our roles outside of our homes and relationships. Somehow, the expectations of the world began to creep into our conversation. We could both see how the standard of being a super, you can do it all, and be it all to everyone type of woman was infecting our self esteems like viruses injected into our veins. We have each been spoon fed specific criteria that makes a woman successful. There is this mold of what a woman today is supposed to look like. There is this vision of what her home should be like. Someone has said how her relationship should be with her husband and children. I am not sure who has set this standard, but it seems that if we do not meet it, we, as women, end up thinking that we lack value. We think that if we aren’t making a certain amount of money with a specific degree, driving a certain type of car, with one type of hair, and our families reflecting the magazine image, we lack value. We feel that without these things, no one will want us, need us, or desire us. Yet this is a lie! 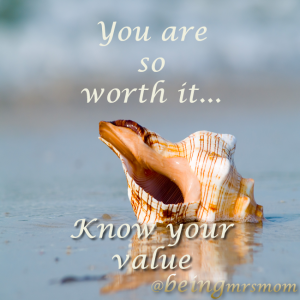 Today, I am here to tell you that you are very valuable and so am I. You are worth it. If no one else ever tells you this, I want you to know that you are of great value. NO!!! STOP! STOP RIGHT THERE!!! I will wait for a moment as you think about this. He did not do this in vain. He did this with you in mind. Sometimes we don’t realize the importance of this statement. That means you are worth His life. You are worth more than any paycheck could ever represent. You are worth more time than any person can give. No one but God the Father, Jesus the Son, and our precious Holy Spirit could ever love you enough to equal your value. The Almighty God, who hung the stars in the sky, took His time to create you. When I say create, I mean that He pieced you together, cell by cell. He took time planning your life and working out ever aspect of it. I know you have had thoughts before that no one loves you or cares for you. I know there have been times when you feel forgotten. I know that you have had times when you feel worthless. Let me tell you…there is One who will never forget about you. He thinks about you all of the time. He spends time, just sitting and thinking about you. Did you know that He dances over you with singing? When you feel like quitting or giving up, He will fight for you. You are worth it to Him. He will never leave you alone. I just want to tell you today, from that bottom of my heart that you are worth it…all of it. You are worth the fight! You are worth the time! You are worth the energy! You are worth the love, the effort, and the patience! You, my sweet sister, are worth the wait! My prayer for you today is that you would be reminded, right in that place, how precious and valuable you are. No more will the chains that once filled my heart hold me captive to the pain that once restrained me.